Unfortunately I still have not had the time to create a new post. This is a rerun post that I thought you would enjoy... especially this time of year. I hope you all have a wonderfully blessed Christmas!! 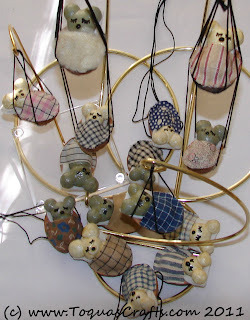 I found Sleeping Baby Mice in my our Christmas decorations!!! This particular egg carton is probably 10-15 years old. I use it (and another) to store small Christmas decorations / ornaments. These cartons are then placed inside a storage box. When my kids were smaller, and I was a single mother, the kids and I would have Cornish Game Hens for Thanksgiving and / or Christmas dinner. We couldn't eat a whole turkey, so we started going the Cornish Game Hen route. This left us with 3 wishbones! 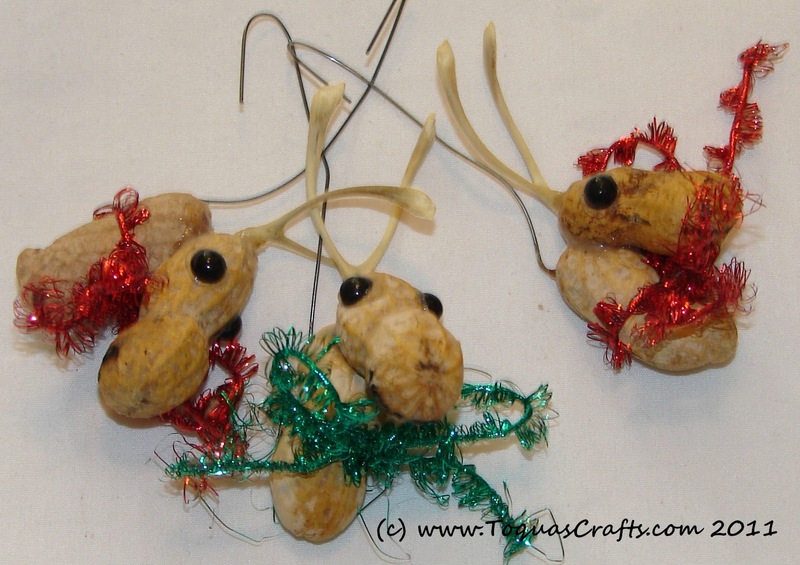 I'd saved the wishbones, and some how or another "saw" that the peanuts were somewhat shaped like a reindeer's face... so I glued two together, stuck the wishbone into the "head" peanut and glued it. I had those 1/2 beads that I used for eyes, drew on a smiley mouth, and tied the stretchy ric-rac around the necks for a bow. Now don't you think those are cute?!? When I found these I remembered I made these a LOOOOOOONG time ago! 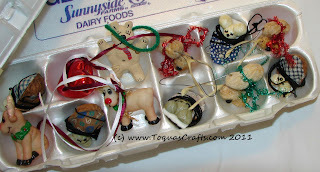 I am certain these are older than the Peanut Reindeer! I am fairly certain I made these at least 25 if not 30 years ago. I remember that my mother had found a small box in my paternal grandmother's things that had several pieces of material cut into quilt piece size. These small pieces of material are what I used for the baby's blankets. I also remember that I found the instructions for these in a magazine, possibly a Better Homes and Gardens. 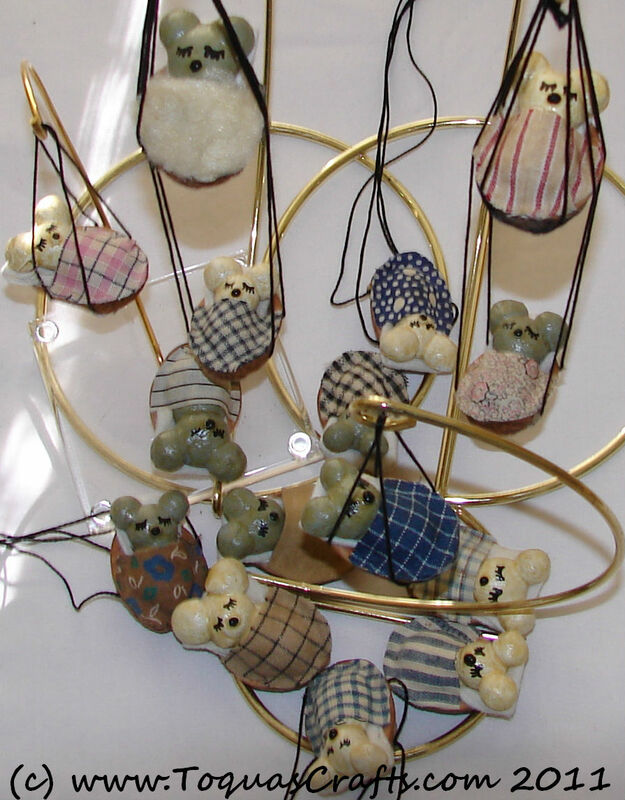 As you can see from the photo above some of the mice don't have strings attached to them. 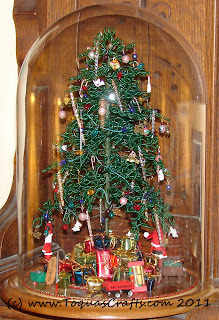 The ones without the strings I've never used on my tree... I guess I've always felt that I had plenty on my tree the way it was. I was wracking my brain for instructions on how to make these cutie patootie Sleeping Baby Mice. I couldn't remember exactly so I did a search. I only found one place that had instructions close to what I remembered doing back then. so in order for me to show you how they look hanging, I used my ornament hangers to hang them on. I'm showing you this one so you can see I even used a teensy weensy ball of dough to create a nose. When you attach your cord, ribbon, or what ever you choose, please take it from me you are better off having the strings a bit wider apart as on the walnut shell on the left. 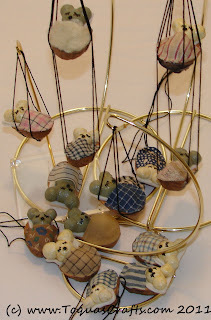 If you have the strings too close together or too far back from the head of the mouse your mouse won't hang correctly, as naturally the head weighs more (not that they have big heads, it's just you don't supply any feet or weight at the foot end). This cute little mouse Christmas craft is so sweet sleeping in his little walnut cradle. And he looks just perfect hanging in a light filled Christmas tree just like his home is on the pine bough branch. I wouldn't be surprised if he woke up and walked over to a candy cane for a snack. He looks so real. And if you make more than one of these ornaments, you could have cute sleeping mouse family. 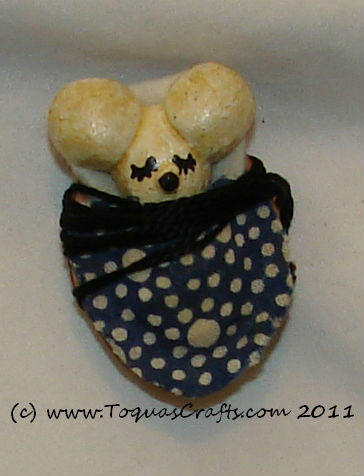 Maybe a father mouse would have a larger sized head, and you could sew him a little pointed sleeping hat. A mom mouse would wear a cut calico, lacy bed hat. A cute Santa mouse would be a welcome addition, but I haven't decided on a Christmas craft design for a Santa mouse as yet. First to start this cute baby mouse Christmas craft, you want to crack a walnut in half lengthwise making sure to keep the two halves intact. Next, you make the mouse's head by rolling a ball the size of a good size pea from the play doh. And then you roll two smaller balls, flatten them and lightly press on either side of the head to make his ears. Now, you roll out a half inch piece of play doh and attach the head to this piece making the body. (I also created a little tiny round ball for the nose.) The body will be covered under the blanket so you only need the allusion of a body. And then you place your little mouse in a safe place to dry. Or you could place the mouse in an 250 degree oven for an hour or longer until he is thoroughly dry and let him cool and finish drying for at least a day. Now, you want to draw a face on your mouse, whiskers, sleeping eyes, nose and a mouth. (I used paint and a very narrow paint brush, but an ultra fine Sharpie would certainly do the job much easier!) 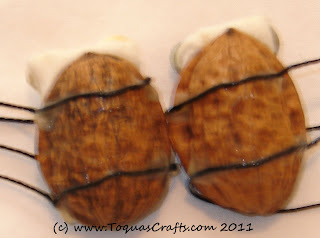 And you take a piece of cotton ball and shape into a little pillow and place this in the little walnut shell half and secure with glue. (I used a folded piece of flannel instead of using the cotton ball for the pillow.) And you can also glue the mouse to the cotton. Next, you take a little square of cotton material and tuck it around the cute sleeping mouse all the way up to his little chin and glue again. 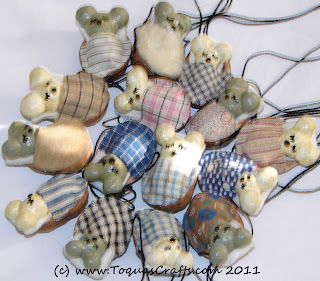 I painted my mice after they were dry. I’ve done some research though, and you could color the salt dough prior to using it. Salt Dough can be colored with food coloring, natural things such as cocoa powder, paprika, saffron (although very expensive) or acrylic paint. * Your finished projects can be left unpainted but they must be sealed on all sides (including underneath) with varnish, gloss or matt, for protection otherwise they will not last long when exposed to air. Finally, you cut two 8 inch pieces of narrow ribbon or yarn and glue lengthwise underneath the shell making sure the cut ends meet underneath the shell, and then repeat the same procedure but place widthwise. Now you glue the two ribbons evenly at the top and tie with a pretty bow and glue again. Don't forget a loop so you can hang your mousy friend on a tree bough. For salt dough mix 1 cup of salt with 2 cups of flour, 1 tablespoon of oil and about 1 cup of water. Mix it and knead it until it is easy to work with. If necessary add a little more water or a little more flour to get a good consistency. 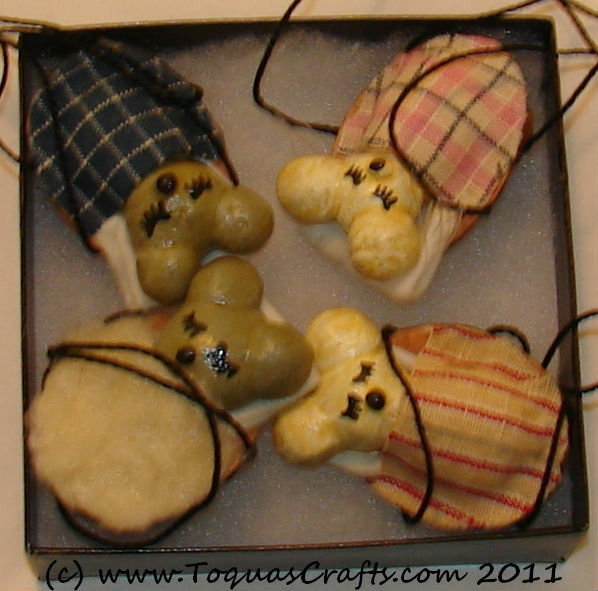 These four Sleeping Baby Mice found a new home this year for Christmas. I have a friend that I know would truly appreciate the fact that they're homemade and from my stash. I believe in giving something that someone would enjoy. 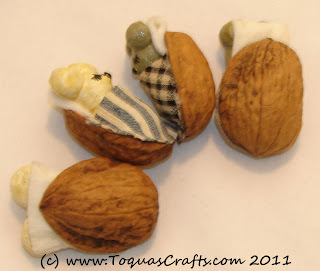 Start saving your walnut shells!! 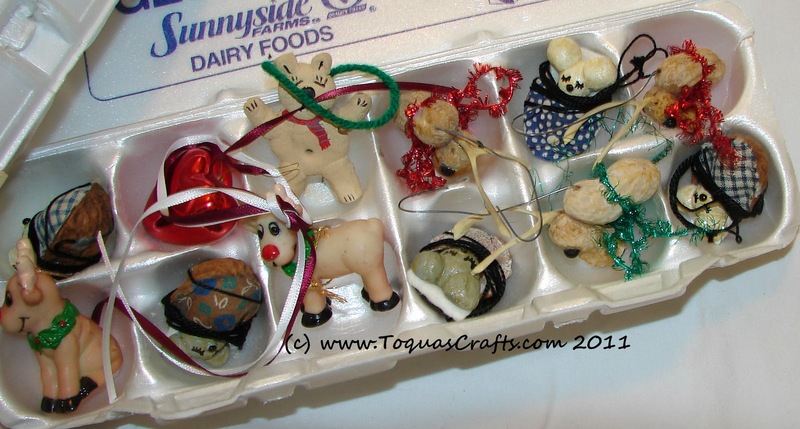 Merry Christmas to you and your family Toqua!